The Waterfront Properties and Club Communities’ neighborhood of Abacoa welcomed more than 14,000 to the event. Waterfront Properties and Club Communities’ Abacoa sales specialists watched their neighborhood come alive during the festival as the residents and visitors took in the sights, sounds and smells. The 2013 installment of the Jupiter Seafood Festival attracted a crowd of more than 14,000 to the Abacoa community during a successful two-day event in April. Festival-goers enjoyed all manner of delicacies from the sea, live music and nautical-themed vendors, while children enjoyed rides, games and crafts. Patrons filled the streets and sidewalks and took in the lively action along the vendor-lined town center and around the busy amphitheater. A wide selection of fresh seafood was offered from local restaurants, including Little Moir’s Food Shack, near Ocean Parks, Frigate’s, near Old Port Cove, Sweet’s, near Jupiter Inlet Colony, and Burger Bar, near Evergrene. Ocean Parks is a quiet community of low-rise condominiums off Indiantown Road, close to the beautiful beaches of Jupiter. 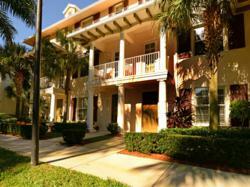 Old Port Cove is an established condominium on the Intracoastal Waterway off U.S. Highway in North Palm Beach. Jupiter Inlet Colony’s picturesque development of homes have views of the lighthouse, and Evergrene, off Donald Ross Road and Alternate A1A, presents a friendly development of single-family homes and townhouses. Waterfront Properties and Club Communities’ Abacoa sales specialists watched their neighborhood come alive during the festival as the residents and visitors took in the sights, sounds and smells. A portion of the proceeds benefited the nonprofit organization Coastal Conservation Association Florida. Coastal Conservation Association Florida advocates for the protection of the state’s marine resources, as well as saltwater angling and comprises 30 districts from the Florida Panhandle to the Florida Keys. Live entertainment took over the main stage both days of the Jupiter Seafood Festival, with the headlining national recording act The Marshall Tucker Band playing the final show. The Marshall Tucker Band rocked the crowd, as did the other performers on the varied bill -- local reggae bands Moska Project and Roots Shakedown, Bon Jovi and Journey tribute bands, The Brass Evolution and Bill “The Sauce Boss” Wharton, a slide-guitar player and blues singer who cooks batches of seafood gumbo onstage. Vendors sold a selection of jewelry, art, clothing and other items with seaside motifs. Another treat at the Jupiter Seafood Festival: Blackbeard’s Pirate Ship, featuring the entertaining antics of Capt. Dan Leeward and Holly Roger, of Pirates of the Treasure Coast. Among the many sponsors that helped make the event such a success were WKGR-FM, Jupiter-Tequesta Air Conditioning and Heating and presenting sponsor Frank, White-Boyd PA.
For more information about the Jupiter Seafood Festival, call 561-847-2090. For more information about Waterfront Properties and Club Communities, call 561-746-7272.